Australian organisations who also believe in the consumer’s right to choose how they wish to receive important information can become supporters of Keep Me Posted by signing up to the campaign’s pledge. 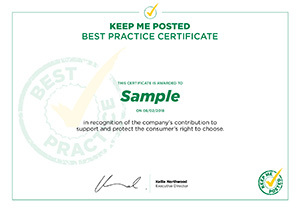 The KMP Compliance Stamp is awarded to companies that demonstrate a commitment to consumer choice. If you prefer your bills and statements on paper, or simply believe it is the consumer’s right to do so, make sure your service providers have the KMP Compliance Stamp on their website and correspondence. If your service providers do not offer free paper correspondence, let them know how you feel with regards to how you want to receive information. You can use this letter as a helpful template. If you are service provider who champions consumer rights and believes that it is the choice of your customers to determine how they receive important information, sign up to The Pledge and become an acknowledged supporter of the campaign. If you think a company deserves a Golden Tick, please let us know! Offer all Australians the choice of receiving information through their preferred delivery option digital or paper. Refrain from penalising in any way, any Australian for preferring to receive information through paper correspondence. Require prior consent from citizens before ceasing to send documents in their preferred way.